Ideal for Instant Action Alerts to an Admin When an Employee Does Bad Behaviors on Their PC. 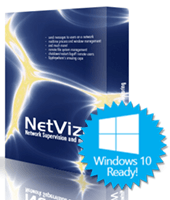 See what our NetVizor customers have said about their experience(s). Here are a few things some customers have had to say about our award winning NetVizor admin alert on bad actions software. These testimonials are unedited - except for last names. Last names have been dropped for customer confidentiality and some customers have chosen to remain totally anonymous. Nathan, I recommend your product to all my clients that wants to know what's going on with their business. Nathan, your quick response to my support questions is much appreciated. I can't get support like this from most of the larger companies I deal with. Thanks again! Fantastic product!! Got the snippet of information required to get rid of an abusive employee. Your promptness of service and support is fantastic. I recommened you to many of my peers in the Information Security field. Thanks for a great product! First of all, I wanted to congratulate you and your staff on the incredibly fast turn around time for service requests. Day or night, your people are right there, every time. all services were excellent. i appreciate your prompt and correct response on a saturday. Have found the software very good at obtaining the information I was looking for. Could have saved me $12,000 in dowry!! Hello, my name is Branka Simic, I am IT specialyst, working in IBM mainframe surrounding, with rich experience in appl and systems programming (batch and online), analysis, maintenance, tunning, problem solving and advising over 25 years. I would like to tell u that i am amazyng with ur software and way of communication, as well with support and user manuals. Really perfect job u done! I have never seen such proffesional stuff , so clear and easy to understand. I was very impressed with your rapid response, at that time of night. I work in the computer industry, and frequently contact technical support on various products. Your response time was exemplary. Just wanted to say thanks for all the support. Your software is top-drawer, as are your support practices. Kudos guys. By the way, I just wanted to comment on the excellent workmanship and how smooth this program is. I haven't felt a single misfire in my testing of it. Mr Polencheck. I would just like to thank you for the extremely fast and efficient service that you gave to me regarding my software problem. Its been a pleasure doing business with your company. and I will be upgrading in the near future. Thanks again for your "GREAT" service. Good morning, my name is Christopher Kearns and I work in Wakefield MA at a company called Darwin Partners. I would like to thank you for you great help last week when I was ordering software from you. I was surprised to receive the great level of customer service especially considering it was midnight when I requested your help. Thank you again for your extra efforts and help. Submit your own NetVizor testimonial. We'd love to hear about your experiences with our spy software products.